Modern architectural design can be wonderfully striking, however, the external appearance of a building is only one element architects must consider. In recent years, as building regulations have evolved, more emphasis has been placed on energy efficiency, both in terms of construction materials and their energy sources. 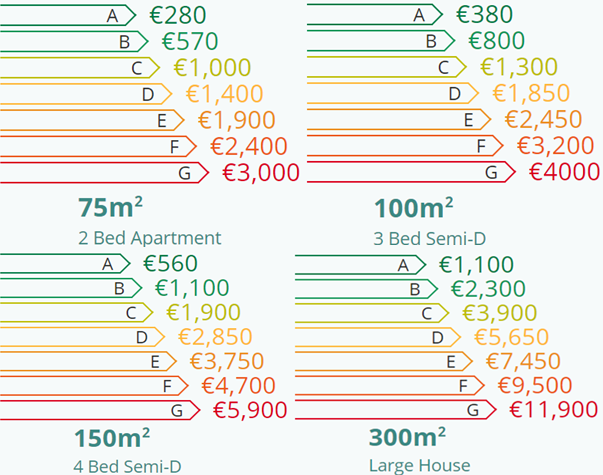 To enable buyers to make an informed decision on the energy requirements of a property, a system of building assessment was introduced in Ireland a number of years ago. These assessments aim to improve how buildings utilise their energy (electricity and fuel) and reduce the amount of energy wasted. In this blog, we look at the differences and similarities between building assessments in Northern Ireland and Republic of Ireland. The 2005 the international treaty, known as the Kyoto Protocol, set ambitious restrictions on energy consumption. Signed by both the UK and Ireland, the UK agreed that by 2020, their emissions would be 20% of the levels in 1990, whilst Ireland agreed that their emissions by 2020 would be 20% of the levels set in 2005. Today, buildings across the UK are responsible for 50% of the country’s energy consumption, which is why there is a need to reduce energy consumption and overall carbon emissions from this sector. Since December 2008, the UK has required that all new properties, domestic and commercial, are evaluated to determine their energy consumption. Similarly, Ireland also requires buildings to be assessed and graded, based upon their energy consumption. Importantly this also applies once a building is sold or rented, therefore allowing prospective buyers to see what their annual energy costs might be. Whilst the assessment of buildings is similar for both Ireland and Northern Ireland, there are some slight differences; in Ireland, the assessment of a property’s energy consumption is displayed on a Building Energy Rating (BER), whilst in Northern Ireland (and the rest of the UK) this is provided by a buildings Energy Performance Certificate (EPC). However, both provide a grade for buildings based upon a survey carried out by an independent authority. Since 2008, it has been a requirement for an EPC to be produced for both domestic and commercial properties in Northern Ireland. This must be completed when construction is either finished or when it is placed on the market for sale or rent. The penalty for not having an EPC is £200 for dwellings and between £500-£1000 for any other property. The EPC provides potential inhabitants with a grade for the building they are viewing. The grades are ranked from A+ (most efficient) to G (least efficient). They are determined by a number of factors such as; primary fuel usage, ventilation, insulation and procedural arrangements. Assessors will attempt to account for the different types of buildings. So, whilst a bungalow with an A grade and an office building with an A grade may not require the same amount of energy, they are still able to utilise their energy with the same efficiency. Buildings with a higher grade will ultimately cost less money in heating and lighting. Energy assessors gather basic information about the property before conducting an assessment during a visit to the site. They collect information, such as how and when the property was constructed, the type of property, number of habitable rooms, dimensions of the building, number of floors, amount and type of windows and the heating system and fuel used. This information is then input into an approved software program which provides details about the building’s energy efficiency. An EPC will display two ratings: (1) your current energy efficiency rating and (2) your potential energy efficiency rating. The potential energy efficiency rating will be the rating you could achieve if you were to follow the guidance outlined in the EPC. You can find out more about EPCs on the Dept of Finance & Personnel website including an example of an EPC. An EPC must be completed by an accredited EPC assessor – these can be viewed on an online register. As previously noted, Ireland differs slightly to Northern Ireland. In Ireland, a BER report must be produced instead of an EPC report. The differences between a BER and an EPC are minimal. Both rate the building based upon its energy consumption and efficiency. However, unlike the EPC provided in Northern Ireland, the BER rating includes only the current energy efficiency rating and does not provide a potential rating based upon modifications that could be made. BERs are calculated using the Dwelling Energy Assessment Procedure (DEAP) software published by Sustainable Energy Ireland Authority (SEAI). DEAP is a free software program and is the official Irish methodology for calculating the energy performance and associated CO2 emissions. It is used by official BER assessors to ascertain the BER for new and existing dwellings. Several factors are considered when evaluating a BER; the space heating, water heating, lighting and any pumps or fans. Within each of these broad topics, there are several different considerations to be made. Despite the BER not providing you with a potential energy rating, the DEAP software provides a great deal of information about the performance of your building. Figure 1 (below) is an example of DEAP’s results net space heating demand tab. In this case it shows the main net space heating demand should be addressed if the BER grade is to be improved. Figure 1 – This graph is an example of some of the information provided during a BER assessment. 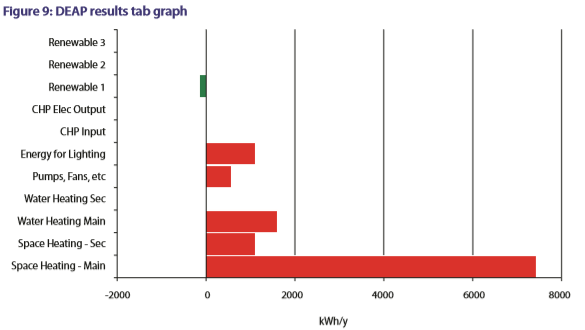 This graph shows that the space heating should be addressed to conserve energy and improve the buildings BER rating. SEAI provide some useful information relating your BER rating to the estimated fuel costs for each BER rating. Some of these estimates are shown in figure 2. Figure 2 – Estimations of fuel costs based upon energy ratings for various dwellings. The Sustainable Energy Authority of Ireland (SEAI) provides information on building energy rating on their website including finding a local BER assessor. A useful function of both regimes is the ability to search for a published EPC/BER. So if you have misplaced your property’s assessment, it is easily retrievable. You can also check neighbouring properties to see how you compare! As buildings account for about half of the energy consumed (UK), it follows that improving the way buildings are designed and operated will assist both the UK and Ireland in reaching its energy reduction targets. Furthermore, by reducing the energy consumption in buildings, the cost of maintaining building services will reduce in addition to a reduction in greenhouse gas emissions including CO2. Action Renewables can provide energy auditing and feasibility studies for businesses in Northern Ireland and Republic of Ireland. If you would like further information on how your business could make energy savings, contact us on 028 9072 7760.